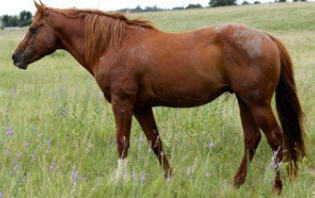 We have raised horses since 1962 and bought our first registered Quarter Horse, Smoke B Tom, from Louis Swick, in 1968. Several of our brood mares go back to him. In about 1974 Bill Cure and I went to New Mexico, with a two horse trailer, to purchase Miss Skip One Brown. She had only been haltered a couple of times. Bill was so impressed with her disposition and how she loaded that he bought her sire, Bay Boy Skip. In about 1978 we bought Pin's Irish Wiski, a son of Poco Pine. We used him for several years. 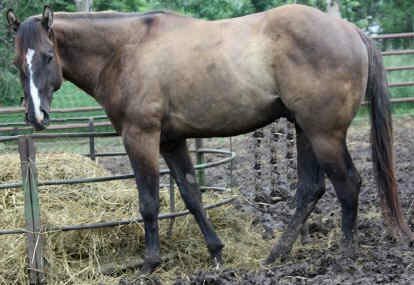 We have also used several outside studs such as Mr Holey Sox, a son of Holey Sox, Bands Mudgrip, a son of Bands Quemado, Goldies Bill, a grand son of Smoke B Tom, Grab N Te a son of Te N Te, Little Exclusive a son of Peppy San Badger. Prices Jim Bob Leo out of a full sister to Mr Gun Smoke, Chico Freckles, a son of Colonel Freckles and Lena Hickory Chips, a son of High Brow Hickory. In the spring of 2000 we went to Oregon and Purchased Candy Man Quixote and his mother, Labonda, from Betsy Westbrook and Harry Campbell. 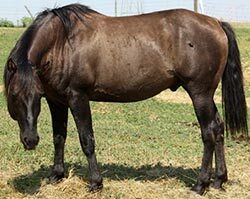 Dustie Quixote MF was foaled on July 20, 2000. 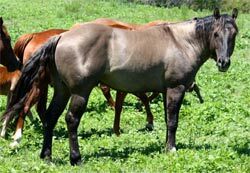 We used the two full brothers on our brood mares and bought some mares from Idaho, Montana, Colorado and Texas to put with them. The foals have the nicest minds and dispositions of any horses we have been around in 48 years. We will have horses on the sale sired by Jessies Rip, Holy Smokin Haida, MC Christmas Spirit and Checkmate Jack.